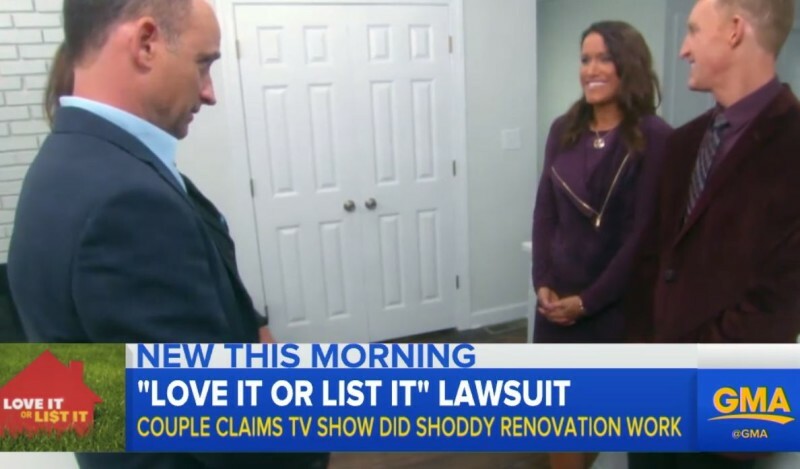 They’re suing Big Coat TV, the Canadian company that produces the show, and Aaron Fitz Construction, the local contractor in North Carolina hired to do the reno work. The couple contend that not only were they victims of shoddy work, they also suffered from a breach of contract, unfair trade practices in violation of North Carolina’s general contractor laws and a “bizarre” business model that creates an “inherent conflict of interest” for a production company that makes most of its money on TV advertising. Duct work left holes in the floor, allowing vermin to enter the house. Low-quality materials like industrial carpeting were installed. Eric Eremita is portrayed as the general contractor, but he’s not licensed to work in N.C.
“These characters are actors or television personalities playing a role for the camera, and in this case none of them played more than a casual role in the actual renovation process.” The show is scripted, with “roles” and reactions assigned to the various performers and participants, including the homeowners. They did not use a licensed architect for the renovation plans. The couple was never shown houses for sale by any real estate agent licensed in N.C. who could broker the sale of those homes. The suit alleges a lot of what we already knew: that a good deal of these reality shows are staged. The couple, who went by Deena and Sully on TV, were on LIOLI episode 152, which filmed in 2015. They had to give the production company $140,000 upfront. About $86,000 of that went to the contractor, Aaron Fitz. They believe their funds were misspent. They say they weren’t contractually allowed to sell the house until after their episode aired. Now the problem is they have shoddy reno work to fix before they can put it on the market. BTW, this reveals another truth about the show — that they’re not seriously looking for houses to buy with host David Visentin on the show. Things went more smoothly for her, even though the renovations took 7 weeks to complete, which is a little longer than most. Like the other couple, she wasn’t able to list her house until after the show aired, either, probably because they don’t want the outcome to be spoiled. When she did sell, she shared the listing for her cute yellow bungalow with us, which you can see here. There are rumors that two endings are filmed, with the homeowners saying both “We’re going to love it!” and “We’re going to list it!” This was not the case with us. We shot one ending and were not told which one to go with. It was 100% cheaper than going with a contractor. In our case, we paid for the labor and some product. Majority of the product was covered by the show and sponsors. For the “big reveal,” about 99% of the work was complete. Like any projects, there is always SOMETHING left to do after the deadline is hit. While the show is not scripted, there were some moments where we were led down a certain road for dialogue. Is HGTV’s “Love It or List It” Fake? Hi Julia, I believe with these shows that once you sign a contract you are at their Mercy… There is a British show called 60 minute makeover, it’s where family members enter the house to surprise their loved ones who will never have the money to do this themselves, which is fair enough. Then there is Grand Design where they are owner builders who can afford the Architects and Site Managers who make sure everything is done to high spec and all the parties involved have to have a licenc including the owners, and if the property is grade 1 or 2 there is another set of rules you have to follow (or else) they make you do it again, of course you need lots of cash for this. Here in Australia all the Reno shows (we only have 4) it’s the same rules as the Brits. There is a lot of red tape in the building industry over here, it’s there to protect every one involved and still people try to get away with unacceptable work. Thank you for sharing. Till next time, regards Esther from Sydney. PS I still enjoy watching the American home shows, no matter what, there are some beauties to inspire and they are well presented shows. I think you’re probably right, Esther. I have a feeling the contracts they signed mean the production company had the right to handle the reno the way they wanted. This might set a precedent for the way they do things for TV going forward, though. It’ll be interesting to see what comes out of it. My husband did some work for a home featured on the show Rehab Addict- it was the series done with Lebron James for his charity in Akron Ohio. That show is phony as can be. Nicole Curtis doesn’t do any of the physical work herself as depicted. For example, if she removes a cabinet, they have already removed it, then placed it back losely so she can pretend to remove it herself. He stated that she arrives late in the day for her shots and they are told to stay away from her. Many delays on the project because she would make changes that either weren’t possible or were structurally unsound. It was so interesting to hear how things really work as opposed to how they appear on tv! That’s one show I don’t hear a lot about from people who have been behind the scenes. Interesting! resolution to this horrible situation. I would love to see an HGTV show that would just simply give ideas on decorating already existing homes. For example, ask the homeowner what their style is, i.e., glamorous, country, mid-century modern, or whatever….then have a designer do a few changes, add this here, take away this. It would give the viewer ideas on how to make a room feel complete. There are so many real estate “reality” shows, not everyone is in the market for a new home. I just like to see design/interior decorating ideas! I agree completely! HGTV used to be full of decorating shows in the old days and they were fantastic! I’m old enough to remember when the fabulous Kitty Bartholomew was the reigning queen of HGTV. Bring her back!! While I agree with you, HGTV contends that the ‘reality realty’ shows have vastly higher ratings than the decorating shows ever did. Thus, that is what they air- the shows people tune in to see. Unfortunately, we are a ‘reality’ driven nation right now. As soon as you can get rid of the Kardashians is the day HGTV can return to a different kind of programming. Yes! I used to love the segment on Decorating Cents where decorators rearranged furniture and brought in other pieces of the homeowner’s furniture to redecorate a room. I do enjoy watching the show because I like seeing what is done. But I don’t believe at a lot of it is real. However, I’ve always commented that if I gave money for renovations to discover that thousands were spent on knick knacks such as ceramic roosters, I would be irate. Furniture is one thing but not the knick knacks. Although I wonder if it’s like Fixer Upper where the budget solely goes to the renovation and none of the furniture stays unless it was specifically built for the house. Of course on that show, the homeowner has the opportunity to purchase any furnishings that they like after filming is complete. Your articles on home shows are always the best, Julia! Thanks for keeping us fellow house obsessives all in the loop :). I, too, wish HGTV would go back to the good old days of Sarah Richardson (not her new USA one that is a reality challenge), Candace Olson, etc. Just good old fashion design!! I did watch the shows for a while in the beginning, but it’s just always the same thing over and over. Sad to say but I sometimes feel that way about Fixer Upper (always a call for more money). Grand design is a beautiful show available on youtube…..i’m glad someone mentioned it. You live in what ? is one of those rare HGTV shows which comes close to Grand design. but as someone who had come to the US a few years ago and seeing ‘house hunters’ for the first time, it gave me a chance to look at different houses, things to look at while buying a house ourselves here…..but now more than the drama, i can’t stand that female’s voice . The “Love It or List It” show is simply unwatchable to me – two spectacularly bad actors sniping at each other and berating the “lucky” homeowners, who are even worse actors. The show doesn’t have a mean undercurrent – it’s a riptide. I go old school when it comes to home renovaton shows. This Old House has fascinated me for decades because, though highly scripted, artfully edited and fronted by a telegenic host, they do show the nuts and bolts of construction, and delve into the whys and hows in a more leisurely way. And…Norm Abrams, baby, Norm Abrams – who doesn’t love a true craftsman? I have been watching This Old House since I was a kid. I love those guys. They are never surprised by some big defect that is going to set the homeowner back thousands. They do occasionally find a problem, but they are usually problems they expected could be there do to the age of the house – like a water line that needs replacing, and no drama with the home owner. Tommy really owns his construction company – same with Rich, the plumber. They have a lot of laughs – especially on Ask This Old House in the segment “What is it” where they guess at the function at some unusual tool. They all seem like they like each other and enjoy their work. They also do more timeless work, with a nod to restoration rather than trends. Tommy will patch an old hardwood floor, while the Property Brothers will rip a classic hardwood floor out, calling it dated. I had a friend who was on LIOLI Vancouver. They “listed it” but were never planning to move. Some of the “for sale” houses in the area weren’t for sale, they just fit in with the script – either location, size, cost etc. My brother-in-law knows one of the contractors, and has done some of the glass work on the show. With one project, there were some interesting design details (relating to the occupation of the homeowner) that never made it to airing. I had already read about the lawsuit filed by the NC couple whose house was featured on “Love It or List It”. I knew most of these shows were scripted but I was surprised to learn at what lengths. Faking or planting problems to make the story line more interesting and hosts portraying to do labor they aren’t actually performing is a bit too much. Its a shame HGTV cant produce more realistic and original home renovation shows. Actually, all of them have the same format week after week. Because of that, you might as well watch the beginning, skip the reno part and then come back for the big reveal. I’ve been noticing a backlash against Love it or List it for some time now. To everything, there is a season. Perhaps this show has had its season, and it’s time for other design shows to reign. All of these shows have a formula, and the formula becomes tired after awhile. I think this is partly why the Property Brothers have been so successful. They have a number of different shows, and keep us interested this way. My favorite is Fixer Upper. Although this also is formulaic, it’s still too fresh and new to be tired. lol! According to that, actors should not portray doctors, lawyers or teachers in tv shows and movies because none of them are licensed to be one in whatever state they film in. What a crazy lawsuit! I don’t care for the created drama on the show but enjoy seeing the before and afters. Sorry, but I have even seen staged things on the wonderful Fixer Upper. Like when they moved that tiny house and fixed it up. Two of the homes they looked at were obviously right next to each other. Yet they showed them driving around to the “next house” as if it was in a whole different area. It’s also pretty obvious Nicole Curtis just butts into whatever the contractors are doing at the time. My father was a carpenter so I recognize when those guys are looking like someone is just wasting their time trying to do something they can get done in a nano second. Do you really believe that those Crasher shows just show up the next day all ready to go? One day there are leaves on the trees and the next morning they show up in snow? LOL Also, there is a thing called getting permits for the work. Regardless of it all I still watch. Maybe it was seeing construction all my life but I love seeing the before and afters more than anything. It’s like having a construction job without all the mess and bother in your own home. I, like others, do wish HGTV and DIY would get back to teaching shows or showing us more how to do jobs. I’ve read the comments about LOIOLI, and have to agree with 90% of them … staged is staged and if you believe it’s “real”, then you need a good dose of reality. I, too, mourn the absence of the shows that help homeowners make significant upgrades to their existing homes through savvy decorating tips, etc. This leads to my comment: in all the posts, no one has mentioned “Holmes Makes It Right” which airs on the DIY network. It looks real … it looks legitimate. I’d like to read feedback from your readers about that show. That’s my husband’s favorite show. For a while it seemed like Mike Holmes was on in our house 24-7! Ha. Now that you mention it, Nina, I can’t recall ever hearing anything negative about that one. Mike Holmes has the best shows! He’s by far my favorite. Yes I agree with you 100% because he is a good home inspector himself and a good contractor, he know his job well and he is license. I agree Holmes shows are the best thing since This Old House….I’ve watched everyone! He shows how things are suppose to be done, the correct way…The bones of the project….Not just paint and Nick Knacks…. Nicole Curtis…Is one I will never under stand, why people are so addicted too….Always thinking she is going to show up and rescue some house….Doesn’t work that way…. I’ve always suspected that the work being done wasn’t high quality. It always seems rushed, low quality materials, and things left undone. I know the camera hides things well. I would never sign up for one of these. The HGTV show Trading Spaces where straw was put on the walls scared me! OH please. LIOLI execs have contracts that cover everything. If homeowners think they are going to get something for nothing, shame on them. Oh, big schock that TV is smoke and mirrors…who knew? Let’s sue someone because we had such injustice done to us. I’m sick of hearing about lawsuits from people like this. Deal with it, baby. The Holmes on Homes show is a great show… Very authentic and genuine. My all time favorite is This Old House. Sad to hear about Love It Or List It. Great presentation of the facts in this blog post. I also enjoy reading the comments.. Your readers have fun comments to read and your responses provide excellent commentary. My friend’s husband calls HGTV “Hate what you’ve Got TV”! He says when his wife has watched it all day long, she hates everything she has and wants what she saw on HGTV. In 2013, an episode was filmed a few blocks away from where I live, partly on a street I walk through several times a week- it’s how I got interested in the show, actually. I never spoke to the homeowners, who ended up “listing it,” but I can say that I noticed one small part of the episode was faked when it aired. After they looked at the first ‘dud” of a house with David on my favourite walking street, there was a montage of the homeowners walking up to a few houses, cut to them walking away complaining to David about said house, and David walking down the street talking to the camera in frustration. All of this was shot on the exact same part of the street as the “dud,” and while the dud was for sale, none of the houses you saw the exterior of were actually for sale. They were all houses I’ve walked by hundreds of times and they were all within a ten-house radius of one another, shot on opposing sides of the street, and filmed right where the street bends around in a crescent.